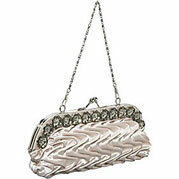 Evening bags and clutches come in many sizes, shapes, colors and fabrics! While you don´t necessarily carry them throughout the event, an evening bag should be chosen to complement your dress when you do have it in tow! Chose a bag of a contrasting color to add an accent to your dress, coordinate the bag with your shoe color or add the sizzle of a metallic or jewel encrusted style to add extra sparkle to your look. The other very important thing to consider is “What will I need to carry in my bag?” Camera, phone, lip gloss, blotting paper, personal hygiene items, sewing emergency kit etc….? Bags can be found in a wide range of prices at a wide variety of sources. In addition to your hometown department stores and boutiques you can find cute clutches at discount stores as well. Keep your eye out for good deals throughout the year and build up an inventory of classics you will use over and over. Check out great online sources for a wide variety of the cutest bags at Bag Links We Love. Check out this J.Furmani Puffed Satin Clutch . . . It´s cute, easy to carry, easy to open, fits a camera and pda, comes in champage and silver for a great price!